For his son, see James Gordon Jr. For the Gotham television series character, see James Gordon (Gotham). James "Jim" Gordon is a fictional character appearing in American comic books published by DC Comics, most commonly in association with the superhero Batman. 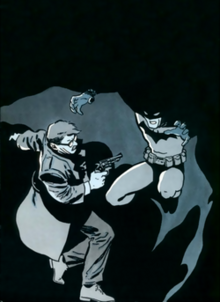 The character debuted in the first panel of Detective Comics #27 (May 1939), Batman's first appearance, where he is referred to simply as Commissioner Gordon. The character was created by Bill Finger and Bob Kane. 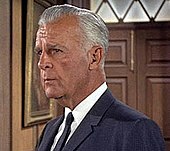 Commissioner Gordon made his debut as an ally of Batman, making him the first Batman supporting character ever to be introduced. Main article: James Gordon Jr.
Commissioner Gordon appears in Batman: Gotham by Gaslight, voiced by Scott Patterson. Whilst an adaptation of the graphic novel of the same name, Gordon is revealed to be possessing the alter ego of the infamous serial killer Jack The Ripper who is the main antagonist of the film, which is a departure from the source material where he still was a hero.